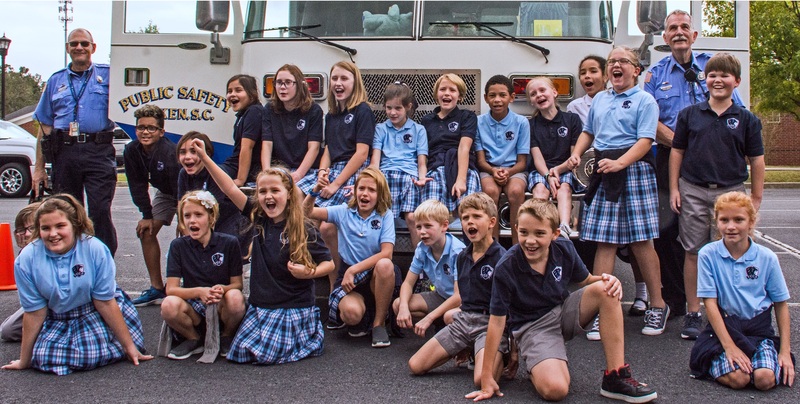 TCCA’s Lower School academic program is exceptionally thorough while remaining age-appropriate and exciting. Below are the highlights of academic instruction for each grade. In addition to academic instruction, students participate in physical education, the arts, music, library, media, field trips and Chapel. Town Creek Christian Academy K4 and K5 ministries are full school day programs. Our Preschool programs promote hands-on, interactive learning. Our education structure is interspersed with Bible, music, science, language, history, handwriting, physical education and chapel. Our teachers use songs, charts, and other interesting activities to ensure future academic success for our preschool students. We are determined to partner with parents to provide a quality Christian Education for preschoolers that is rooted in a strong Biblical worldview. Our curriculum for K4 is called Footsteps for Fours. Our classes promote active, hands-on learning and includes a balance of individual activities and group activities. During a typical school day, math, phonics, and prereading lessons are interspersed with age-appropriate music, science, language arts, social studies, and handwriting segments. Some key learning concepts are solidified using math manipulatives, cooking experiences, and periodic review. Each Bible story teaches a simple truth about God. Early handwriting skills and age-appropriate phonics are taught with songs and colorful visuals that will keep our preschoolers happy and engaged. Click here to view the K4 Scope & Sequence. Our curriculum for K5 is called K5 Beginnings. Our teachers want to create a strong desire for learning in our students. We believe the ability to identify word family patterns, strong phonemics awareness and sight word recognition will help with early reading and writing skills. Daily classroom themes incorporate science, Heritage Studies, and literature along with stories for listening and reading comprehension. In addition to teaching physical education, art, science, and heritage studies, oral composition, phonics, and reading comprehension, we teach our young students to use their natural curiosity to experience and explore the world around them. In class, math manipulatives are used to explain basic math concepts, such as numbers, time and money. Kindergartners will have an active role in Chapel each week. They will sing, pray and play the truths they learn from their Bible story class. Our goal is to spark an early love for God and His Word in their tender hearts. Click here to view the K5 Scope & Sequence. Bible Truths 1 includes lessons with memory verses and stories from Old and New Testaments. Dramatic segments, application stories that reveal God’s character, various hands-on-activities, and visuals reinforce students’ learning experiences and helps students learn to trust God. Heritage Studies 1 follows the events in the New World from pre-1000 to 1682. Your students will learn about the Vikings, Columbus, Plymouth Plantation, trading, Native Americans, and early homes and schools. Science 1 starts students on the path of scientific inquiry with an introduction to the senses, heat, sound, animals, and heavenly bodies–presenting God as the Creator of all things. Math 1 uses manipulatives and real-life experiences to teach place value, addition, subtraction, geometry, time, money, measurement, and fractions—all with engaging themes and characters. Writing equations, reading graphs, and other concepts are introduced as part of problem-solving skills. Phonics & English 1 uses exciting theme lessons to combine phonics, reading, listening, comprehension, creative writing, and grammar. The six units cover short and long vowels, single consonant blends, and diagraphs, r-influenced vowels, special vowel sounds, silent consonants, suffixes, and syllable division. Phonics patterns are also taught using word families. Phonics characters make phonics generalizations fun and memorable. Spelling 1 focuses on application through studying generalizations, and using spelling as a tool for communication. Enjoyable guided activities help your student learn word structures and dictionary skills. Reading 1 introduces your young reader to a variety of colorfully illustrated fiction, poems, plays, articles, and Bible stories. Reading selections are developed to incorporate phonics, English skills, service words, and word families. New vocabulary words for each story are introduced in sample sentences to provide context clues. Discussion questions and teaching strategies give opportunities to develop critical thinking skills and comprehension. Both oral and silent reading habits are developed. Handwriting 1 introduces PreCursive models for the entire alphabet. Proper letter formation is reinforced by copying Scripture, poetry, words, phrases, and sentences with simple writing instructions for first-graders. Bible Truths 2 has our teachers help students understand God’s truth for practical living through a thematic, chronological study of the Old and New Testaments. The educational materials includes scripturally supported overviews of key biblical doctrines, unit memory verses and hymns, supplemental read-aloud stories, unit review activity sheets, reproducible learning activity pages, instructions for one-on-one and group learning activities, a glossary of biblical terms and a CD of corresponding reproducible. Lessons also integrate a missionary story and an application novel. Heritage Studies 2 explores American culture in colonial times from Jamestown to the War for Independence. The text features colorful illustrations and discussions of colonial farming, shop keeping, clothing, and also interesting information about kings and queens in Europe ruling at the time—all presented in understandable language for the 2nd-grade level. Science 1 teaches the student how to use science process skills to learn and tell about Gods creation. The program focuses on what scientists do, living things, plants, environments, fossils and dinosaurs, the layers and features of the earth, how the earth moves, natural resources, light, forces and motion, and how the body works. The student develops his science process skills as he participates in hands-on activities and projects. Math 2 emphasizes traditional grammar, such as parts of speech, sentence structure, and mechanics, and provides practice with essential reference skills. The English educational materials explains the step-by-step use of the Writing Process for eight different types of writing assignments, such as a friendly letter, a make-believe story, instructions, a book report, and more. English 2 uses exciting theme lessons to combine phonics, reading, listening, comprehension, creative writing, and grammar. The six units cover short and long vowels, single consonant blends, and diagraphs, r-influenced vowels, special vowel sounds, silent consonants, suffixes, and syllable division. Phonics patterns are also taught using word families. Phonics characters make phonics generalizations fun and memorable. Spelling 2 reinforces the most reliable spelling patterns and introduces the most common structural generalizations. Writing weekly journal entries allows your student to apply the spelling and composition skills that he is learning. The student also practices dictionary skills and Bible word studies. Reading 2 encourages higher-level thinking, emphasizes character traits and Biblical principles and truths, and helps students grow in reading comprehension with compelling stories. The two-volume reading educational materials includes familiar favorite stories as well as exciting new reading selections. Handwriting 2 provides detailed direction for good handwriting techniques. Students will practice consistent letter formation for the PreCursive alphabet and transition to the cursive alphabet. Student activities reinforce the basic material and enhance the handwriting educational materials. Bible Truths 3 explores Bible accounts in the Old and New Testaments and encourages solid Bible study skills. Missionary stories and stories from Church history are also included to inspire students and help them apply Biblical principles to their everyday lives. Heritage Studies 3 relates in understandable language the story of America from the framing of the Constitution up until the days of the Wild West. Students will relive key moments in our Nation’s history and discover interesting traditions from the past. Exciting activities provide students with an outlet for the facts they learn such as building a model log cabin, folding the American flag, learning early American songs, and making musical instruments. Science 3 provides age-appropriate scientific information through text, charts, and colorful photographs and illustrations. The 3rd grade science educational materials also contains detailed instructions for all experiments, activities, and projects. Math 3 provides practice and review of basic math and introduces the fundamental principles of fractions and geometry. The math educational materials seeks to develop problem solving skills through word problems. Students will regularly have chapter and cumulative reviews to reinforce the covered math concepts. Spelling 3 teaches students to apply more generalizations to word families and give extensive practice in adding suffixes. Expanded dictionary skills, guided journal entries, and Bible word studies are all key components of the 3rd grade spelling educational materials. Each lesson provides enjoyable activities to help students remember the spelling words they learned. Reading 3 deepens reading skills and comprehension by providing a collection of engaging reading material for the 3rd grade level. The two-volume reading text guides students as they build reading comprehension, grow in phonics skills, and absorb character-building stories that demonstrate biblical truth and timeless virtues. Handwriting 3 reinforces good handwriting habits and establishes a consistent, legible writing style. Handwriting practices include copying poems, paragraphs, Bible verses, and writing personal compositions. Heritage Studies 4 brings to life our history from the founding of America to World War II from a biblical perspective. The lessons include a study of the regions of the United States. A timeline has been added to each chapter opener. Chapter focus statements have been added to the history chapter openers. Locator maps have been added to the region chapters. Science 4 allows students to explore creation through an understandable and engaging presentation of text, diagrams, photographs, and illustrations. This elementary science educational materials contains instructions for interactive experiments, projects, and activities. It promotes higher-level thinking skills through brief writing exercises. The textbook discusses a spectrum of scientific fields including ecosystems, plants, insects, the eye, the digestive system, and principles of motion and energy. Math 4 provides an interactive approach to build your student’s understanding of multiplication, division, decimals, fractions, geometry, and pre-algebra. A sea theme with Captain Bailey and his pet seagull Clipper enhances real-life math applications, problem solving, and estimation. English 4 places an emphasis on English grammar and usage as well as practice with essential reference skills for using dictionaries and encyclopedias. Parts of speech and sentence structures are examined in detail to help students gain a mastery of grammar. The Writing Process is explained step-by-step to be implemented in a variety of writing assignments, such as a personal narrative, a research report, and a business letter. Spelling 4 introduces new words to master for the 4th-grade level. Word histories and etymologies are presented to build understanding and interest in the English language. Journal entry ideas provide students with weekly writing practice and the opportunity to apply good spelling to their writing. A dictionary skills section will also be included to familiarize students with using a dictionary properly. Reading 4 provides engaging reading material for the 4th-grade level. Presented in a colorfully illustrated format, the literature selections and poems are designed to increase reading comprehension, build vocabulary, and develop an interest in reading. Handwriting 4 refines handwriting skills and reinforces a legible and consistent cursive alphabet. The worktext provides practice preserving legible writing while using an ink pen. Bible Truths 5 encourages students to apply the Bible knowledge they learn to their everyday lives. The colorful text provides historical information about the Bible stories discussed to increase understanding of the passages. Worksheets allow students to demonstrate and improve their knowledge about the Bible passages presented. Good Bible studying techniques are explained and encouraged throughout the text. Heritage Studies 5 continues the narrative of American history from the development of the automobile in the late 1800s through the inauguration of President Obama in 2009. Topics are presented from a Biblical perspective and include the invention and influence of the automobile and airplane, World War I, the Roaring Twenties, the Great Depression, World War II, the Vietnam War, struggles over civil rights, the war on terror, Afghanistan and Iraq wars and immigration decisions. Science 5 explores God’s creation in a study of minerals and rocks, fossils, matter and heat, sound and light, weather, ecosystems and the respiratory and circulatory systems. Students develop science process skills by participating in hands-on activities and projects. The Science 5 student text provides fascinating scientific information through understandable text, charts, diagrams, and colorful photographs and illustrations. The student text also contains detailed instructions for all experiments, activities and projects. Math 5 builds confidence in working with fractions and increases students’ understanding of math concepts by using manipulatives, which help students visualize the ideas discussed. Students will build upon previous math knowledge and be challenged by an optional pre-algebra chapter. English 5 studies traditional grammar and guides students through the step-by-step use of the Writing Process for a variety of writing assignments, such as compare-contrast essays, persuasive business letters, research reports, and more. The student work text provides guided practice, independent practice, chapter reviews, and cumulative reviews. The elementary English educational materials provides a good balance of grammar and writing instruction. Spelling 5 introduces new spelling words organized by phonetic sound for the 5th grade spelling level. Word histories and etymologies are presented in “Word for Word” sections to build understanding and interest in the English language. Journal entry ideas provide students with weekly writing practice. Reading 5 provides engaging reading material for the 5th grade level. Teachers will teach from materials which are presented in a colorful and richly illustrated format. The literature selections help students build reading comprehension, exercise critical thinking skills and cultivate an appreciation of literature. Handwriting 5 refines students’ handwriting skills and guides students in maintaining consistent, legible penmanship.